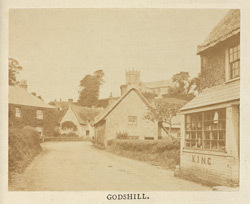 "The Worsleys had, through many generations, the family seat near Godshill. This village is one of the most picturesque in the isle, and one of the ancient parishes that existed before the compilation of the Doomsday Book. It contains one of the six churches given by William Fitz-Osborn to the Abbey of Lyra. The church, which is of Saxon architecture, stands on a steep hill...In its tower are five bells and a clock. It contains many curious monuments, and some modern ones to the memory of the Worsleys. It is a vicarage, in the gift of Queen's College, Oxford, and joined to the rectory of Niton."